Do you want to be a changemaker? Is your writing powerful enough to be the voice of the unheard? If all you have been looking for is an opportunity, it’s time to knock on the right door. The Milaap Fellowship Program provides graduates /young professionals the platform to make an impact. It gives you six months to live, experience and contribute to an important cause while documenting inspiring stories of change. Milaap is offering a full-time position designed to increase our impact and provide Fellows with a unique insider experience. We are now accepting applications for our 12th batch starting July 2019! Our chosen Fellows will join us at Milaap’s headquarters in Bangalore, India to attend a training program to mark the beginning of their journey of bringing inspiring stories to the fore. Milaap is providing driven, socially responsible students and young professionals a full-time position in rural,semi-urban, and urban regions. Our Fellows become the eyes and ears for Milaap on the ground. Step 1: Understand what Milaap is all about and read the Fellowship Program description carefully. Although it will be a remarkably exciting adventure, the program will also be demanding and challenging. Ask yourself sincerely if this is the kind of program that you are ready for. If your profile fits our requirements, a member of our team will get in touch with you in order to schedule interviews. If you are one of the super folks selected, Congrats! For starters, you’ll have to attend a five-day training at Milaap headquarters in Bangalore. The training will cover our model, the tools, and the resources you will be needing during the Fellowship Program. We will make sure to provide you with some essential information that you will need on your placement site too. 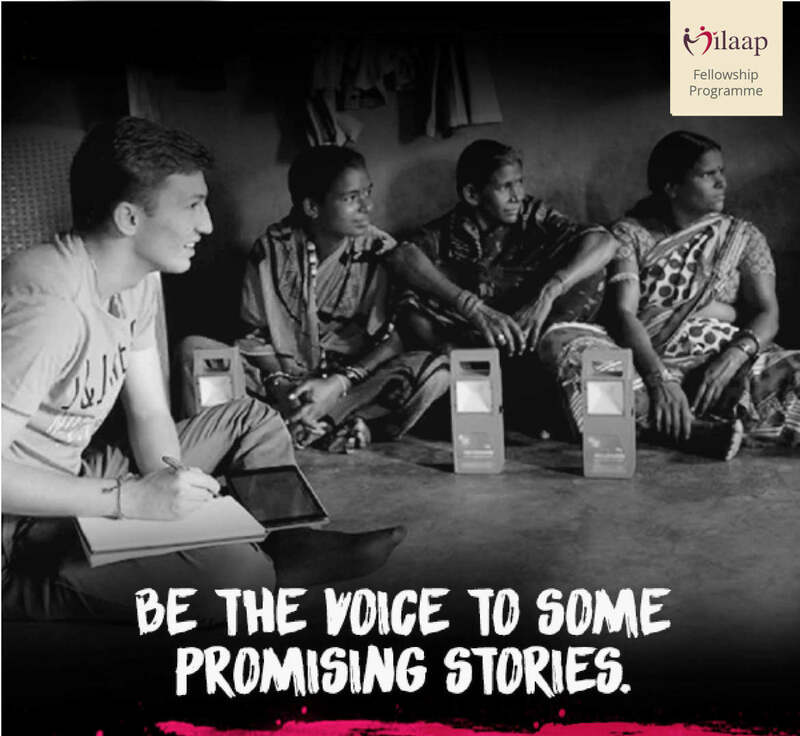 The training will also give you an opportunity to meet and interact with the Milaap team. Right after the training week, you would leave for your assigned location. The initial 7 days can be used to settle into your location and get to know your Field Partner. Once on the field, you will be assigned a diverse set of daily tasks requiring creativity, sense of responsibility, and autonomy. We would also like you to share your experiences on the field through blog posts. Your contributions to the Milaap blog and other content platforms such as Karmany Connect, The Better India and The Optimist Citizen will be read by a large audience. The Fellows will be paid a stipend on a monthly basis. However, they are expected to cover for their visa, flight tickets, and medical insurance. Unfortunately, we cannot support them in their pursuit of visa, but we will, of course, provide them with all the required documents. Also, please keep in mind that the Fellows might be required to get a few recommended vaccines beforehand. Make sure to contact the doctor to get more information regarding it. We currently accept two batches of Fellows per year, with an average of 10-15 Fellows per batch. *If you are extremely passionate about joining us as a Fellow, and have missed the deadline, drop in your CV and cover letter. If we feel you are extraordinary, we might still consider your application. We welcome your application to the Fellowship Program and wish you good luck in the selection process. We are looking for applicants with substantial cross-cultural exposure and, at least, a Bachelor’s degree. Applicants should also bring with them a high level of motivation. The minimum age requirement for the Fellowship Program is 20. The Lend Fellows must be highly proficient in written and spoken English. Being fluent in one or more of the following regional languages is a plus - Hindi, Gujarati, Bengali, Odia, Tamil, Kannada, Assamese, Mizo. What does a Batch of Fellows look like? The batch is diverse as there are fresh graduates as well as experienced professionals. For example, there have been Fellows from streams like journalism, media studies, sociology, B.Tech etc along with professionals from various sectors. What does my day as a Fellow look like? Daily tasks of Lend Fellows are never the same and vary depending on many factors, like the location of the Field Partner and the focus areas of the Field partner, amongst others. As a Lend fellow, you will be working out of the field partner’s office- as a representative of Milaap Lend. You would be planning and going for your field visits to meet borrowers funded by Milaap, writing journal updates post field visits, writing loan-stories, ideating and creating blog posts based on your experience on the ground, and conducting field-partner training. However, all Fellows have to come up with inspiring and powerful stories of change. Will I have time for traveling and sightseeing? The Milaap Fellowship requires a six-month commitment from the Fellows. Hence, it will be your first priority to try and make sure you complete your deliverables on time. However, we are generally flexible concerning short leaves, provided that we have sufficient notice and the duration of the leave is reasonable. However, as a Fellow, one will have time to travel and engage to come up with interesting blog-posts. The knowledge about the culture and people of the area will engage the Fellow more and give us powerful insights. What do I need to bring along in terms of electronic equipment? You will require a laptop, a mobile phone, internet dongle and a digital camera on the field. Make sure to include these items when planning your budget. Will I be sent to a safe region/city? This depends on your interpretation of safety. We advise you to do extensive research on the region/city in which you will be placed. As your safety is of great concern to us, we will never send you to a location you’re not comfortable with. What do Fellows do after completing the program? Opportunities abound after the completion of the program. From pursuing their Master’s degree to working in the journalism space, the program has often cemented our fellows’ true interests and passions. A few of our previous fellows joined Milaap as full-time employees! Follow us on Facebook to read about our fellows' first-hand experiences and the inspiring stories they have covered!